"How to Win Friends and Influence People" is one of the first bestselling self-help books ever published. 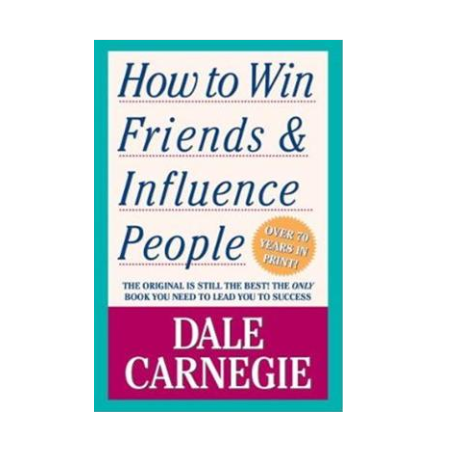 Written by Dale Carnegie and first published in 1937, it has sold more than 15 million copies. It has been translated into many different languages and was a New York Times best seller for 10 years. Financial success, Carnegie believed, is due to 15 percent "professional knowledge" and 85 percent to "the ability to express ideas, assume leadership, and arouse enthusiasm among people." He teaches these skills through underlying principles of dealing with people so that they feel important and appreciated, without making them feel manipulated. Carnegie also emphasizes that, the ability to speak is a shortcut to distinction. It puts a person in the limelight, raises one head and shoulders above the crowd. And the person who can speak acceptably is usually given credit for an ability out of all proportion to what he or she really possesses.